This is the entire transcript of a short video from the Ecofiscal Commission chair. The man is clearly not a Hobbesian. "Mainstream economics assumes that people are driven by the rational pursuit of self-interest," not by assuming people don't want to be free-riders. Game theory would probably dictate people would choose to be free-riders whenever that was deemed possible - and recipient lists of most "conservation" subsidies would support that. I suggest people delight in free-riding. The "global solution" as motivator is probably not traditional economics either - "self-interest" is. Choosing the scope of time and place relevant to most of a population's perception of self-interest is subjective, but kin selection theory could be a guideline if we equate how restricted most animals' willingness to sacrifice is with how they define the boundaries of the self-interest. If people do wish to do their part, they might want to know what a fair price is. I'll try to keep my serendipitous journey to an understanding of the social cost of carbon brief. It started on a treadmill, listening to Professor Robert Sapolsky lecturing on Human Behavioral Biology (which included a version of the Haldane quote above). Sapolsky recommended an older book by James Gleick, Chaos: Making a New Science. That book laid the foundation for my limited understanding of the determination of a social cost of carbon (SCC) - which is the desired basis for pricing emissions. For others sharing my struggle with statistics, I'll try to deliver the message displayed in these figures another way. From Wikipedia: "A sample solution in the Lorenz attractor when..."
On a winter day 50 years ago, Edward Lorenz, SM ‘43, ScD ‘48, a mild-mannered meteorology professor at MIT, entered some numbers into a computer program simulating weather patterns and then left his office to get a cup of coffee while the machine ran. When he returned, he noticed a result that would change the course of science. Weather forecasts and chaos are relatives. The MIT article indicates Lorenz communicated, "the effects of large things, like the increase of carbon dioxide in the atmosphere, are not hard to discern," but forecasting specific conditions at a distant time are. James Lovelock's Daisyworld is another simple model - this one displaying a climate feedback mechanism. These mechanisms add to the uncertainty. Uncertainty is not noted only by skeptics - it's apparent in a chapter from an International Panel on Climate Change (IPCC) assessment discussing "Social Economic, and Ethical Concepts and Methods." After delivering a methodology that calculates the social cost of carbon (SCC), the report states, "It should be emphasized that the calculation of SCC is highly sensitive to the projected future trajectory of emissions and also any current or future regulatory regime." It's also very sensitive to uncertainty in damage functions and in discounting future values to the present (the discount rate). Three IAMS have received most attention in this literature, all developed in the 1990s. The models have undergone various refinements and updates. While the details have changed, their general structure has stayed same. The marginal damage cost of carbon dioxide, also known as the “social cost of carbon,” is defined as the net present value of the incremental damage due to a small increase in carbon dioxide emissions. For policy purposes, the marginal damage cost (if estimated along the optimal emission trajectory) would be equal to the Pigouvian tax that could be placed on carbon, thus internalizing the externality and restoring the market to the efficient solution. As I understand the statistics in Table A5 (above), for a discount rate of 3% the average of the SCC from the 3 IAMs is $41.67 per tonne CO2 equivalent (t CO2e). But the range of means from the different ISMs is $19 to $68. That's quite a variance, but not nearly as great as the variance in results within the individual models. The standard deviation for the PAGE ISM is $117, indicating the results might be a carbon benefit -which is also the case for FUND where the standard deviation is double the mean. None of the distributions would look normal - two skewed to the right, the other far to the left, and while I'm foggy on kurtosis my limited understanding concludes there's a lot going on at the tails of the distributions. the SCC is extremely uncertain, posing problems for policymakers and investors. The idea is to set a warming limit that removes the worst possible outcomes, because the uncertainly of how to price outcomes grows with greenhouse gas concentrations in the atmosphere. Some economist question the need for emissions, or cumulative atmospheric greenhouse gas concentration, targets: if the results of models were certainties pricing would make more sense. An appropriate SCC/Pigouvian tax could be set where societies might choose higher emissions and much higher wealth, allowing mitigation measures to be paid for. But certainty does not exist. If the ideal globally applied Pigouvian tax would restrict emissions to levels where catastrophic outlier climate scenarios are extremely unlikely, it would also be restricting emissions to a level where it is not improbable the emission would deliver a social benefit, particularly as defined within the limited scope of oneself and their siblings, cousins, children and grandchildren. It is impolitic to say this, but climate change is not expected to impact all places the same, and I expect the probability of a social benefit, and not a social cost, is higher in much of Canada than elsewhere. Canadians cannot expect paying a price on carbon to have value for them, or their close kin. I'll cover messaging in another post, but here I'll only emphasize if I was creating a value proposition to sell carbon pricing I would sell it as insurance. Two forms of uncertainly in this discussion are: the extent of change that could occur, but more importantly when it could occur. Recursive equations from chaos theory include, in my limited understanding, results of infinite range within a finite space (the butterfly is named after an image mapping the results of a chaotic equation) . If a tipping point is in the result set of model, the uncertainty could be in when a tipping point is reached, not if. It is the degree of opacity and uncertainty in a system, as well as asymmetry in effect, rather than specific model predictions, that should drive the precautionary measures... The popular belief that uncertainty undermines the case for taking seriously the 'climate crisis' that scientists tell us we face is the opposite of the truth." Calculating the cost of emissions in project/policy planning is an altogether different thing than introducing a broad carbon tax. Many economists argue it's worse as consumers and businesses can find more efficient ways to limit emissions if they are priced. That may be true, but it's hard to trust a government's intentions as noble when it fails to calculate an implied cost of carbon of its policies while promoting a general price on carbon. personal costs are perceived to be too high. could damage the wider economy. believed not to discourage high‐carbon behavior. Governments may want to tax carbon to increase their revenues. There are good reasons for all of these concerns. I'd think the economic theory very straightforward on how taxing necessity goods is, by itself, regressive. Most proposals for carbon pricing therefore include counter measures to counteract the regressive impact. A failure to discuss the impacts of taxing necessity goods is not the only failure of omission from most economists. Public opinion polling consistently shows a preference for doing uneconomic things with the revenue - particularly funding projects where the implied costs of carbon reduction is far higher than both the local carbon tax and more broadly desired Social Cost of Carbon. If that contradiction isn't illogical enough, there is also a preference for spending on lowering carbon emissions over hardening infrastructure to withstand more demanding climate conditions. Where local carbon taxes are disproportionately high, it would make more sense to spend on adaptation because 100% of that spending has a benefit in the jurisdiction, unlike spending on reduced emissions which has a diluted, global, benefit. The Ecofiscal report noted at the beginning of this post claimed to include case studies of three jurisdictions where carbon pricing was introduced. A couple of the cases could have included some more useful messages, and the other one could have been omitted altogether. California was probably in the report due to the pending election in Ontario. The now defeated Wynne government had joined the Western Climate Initiative (WCI), and implemented its Cap and Trade system. California had not reduced emissions to anywhere near the extent Ontario had prior to introducing the system, and most of the reductions it does claim it attributes to imported electricity. Even by its own questionable accounting its percentage reduction is only slightly better than the United States' as a whole since 1990. The United Kingdom was the second case study - and there reductions have been impressive. Like California carbon pricing is just one tool used in the U.K. in lowering emissions. Steve Aplin does an admirable job of debunking the notion that the price was the most significant factor in the U.K.'s accomplishment, but I do think there's a relevant point to be made. A local carbon price was added on top of the European Emissions Trading Sytem (EU ETS). The combination of the two rates was probably enough to raise the price to where the marginal cost of generating with coal exceeded the marginal cost of generating with natural gas. Good for emissions in the U.K. but some might question whether it made a difference on a global scale. ... excluding nuclear power and CCS results in a dramatic increase of carbon emissions: while a CO2 price of 100 €/t brings down emissions from 900 Mt to 200 Mt per year, emissions increase to more than 500 Mt if nuclear and CCS are unavailable, even at 30% wind. Hence, excluding nuclear and CCS from the set of available technologies will help wind power to become competitive, but it also leads to dramatically higher CO2 emissions. No doubt a price on emissions can be set that manipulates supply mix decisions - but that is not setting an appropriate Pigouvian tax reflective of the Social Cost of Carbon (SCC). It is simply gaming a system. Similarly, setting a price on emissions well below the desired SCC does bias supply mix decisions - and not in ways that prioritize reducing emissions. I found the Ecofiscal paper's omission of the EU ETS relevant for a couple of reasons. I've never seen a coherent explanation that a carbon tax and a hard cap are comparable economic tools. The tax is, like any tax, demonstrable on supply and demand curves - as is a subsidy. Both are textbook stuff. I'd assume a textbook showing a quota, presumably flattening the supply curve, would have to impact market efficiency. I understand the claim they are alternative ways of controlling emissions but I fail to see how a quota would be as efficient as a price. Aside from the theory, we've seen quotas used as an excuse to be reckless in setting sub-optimal policy. In 2011 the Executive Director of Germany's Environment Protection Agency was arguing his country's nuclear phase-out wouldn't impact emissions because there was a cap due to the ETS anyway - and California is now similarly combining its small carbon pricing with a grand ambition to exit nuclear. Germany and Sweden both introduced taxes on nuclear fuel based on emoting nuclear should not benefit from a price on carbon despite it having no emissions (while operating). The third case study Ecofiscal presents is British Columbia, and its carbon tax. This tax is broad based and was introduced within a package that would make it revenue neutral through complimentary cuts in other taxes and rebates. Ecofiscal claims a reduction from business-as-usual emissions of between 5% and 15%, with "at most a very small impact on economic growth." That could be the basis of a positive story, but the narrative may well be scuppered by claims emission rose when the carbon price was frozen (at $30 a ton). There are more hints price elasticity of demand is not solely driving the short-term reductions in the studies cited by Ecofiscal, but the existence of the tax itself reduces emissions. This should be explained. There are many taxes and prices for energy throughout the world, so it would be expected a general price elasticity of demand is known, but the claim goes beyond the demand curve slopes down and to the right. Either some effect exists shifting the entire demand curve, such as virtue signalling, or more interestingly, some effect pushes the supply curve up - meaning suppliers of emissions intensive goods charge more than they would in the absence of a tax. Both B.C. and California have particularly high gasoline prices for non-tax reasons. 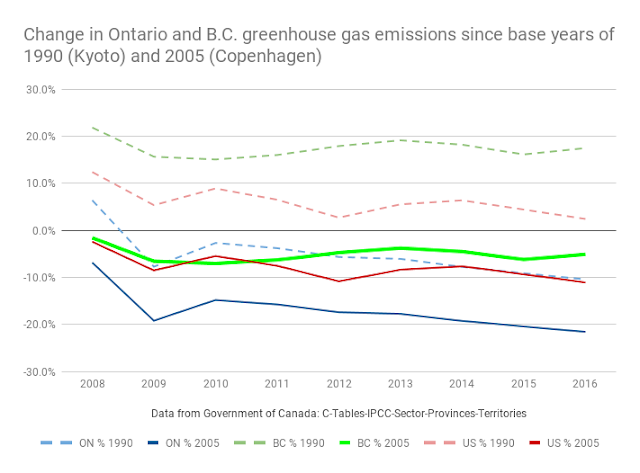 While there is much interesting in the BC studies, it is not only true it's performance in reducing greenhouse gas emissions lags Ontario's, it also lags that of the USA. I find too little evidence to support the proposition that carbon pricing is THE "solution that makes sense for both the environment and the economy," as promised by Ecofiscal. It is however a solution it makes sense for Ecofiscal to promote and policy makers to attempt to sell. In the latter 1990's Canada signed a Kyoto accord that targeted emission cuts to below 1990 levels, but it did not attempt to meet its target. This was not surprising as the USA didn't either, and that country's legislative body made clear they'd never ratify such a treaty. In 2009 Canada made a commitment to achieve cuts using 2005 as a base year, but crossed its fingers in doing so by tying the commitment to passage of the goal by the USA in legislation - which was not expected to happen, and didn't. ...Countries would be legally required to enact domestic climate change policies ...Countries might then be legally obligated to report their progress toward meeting those pledges at meetings held to identify those nations that did not meet their cuts. Since negotiating a "name and shame" deal the US elected Donald Trump as its President. If all that is required is a plan and a lack of shame, economists may be best suited to the task. If actual achievement of reduction goals is important, economists should not get carried away with their analysis of carbon pricing in such places as BC and California, which only serve to demonstrate the difficulty of reducing emissions. 1. This graph is an update of one explained in How we got to here. 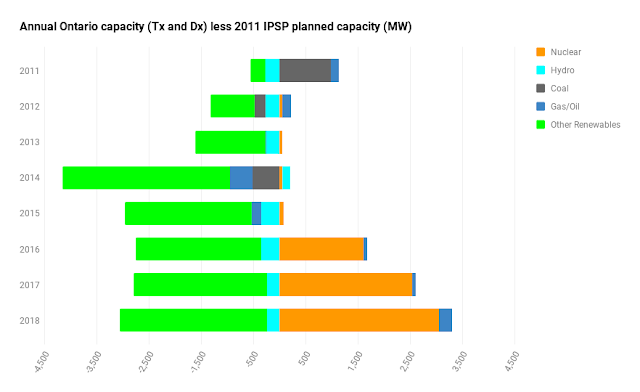 The plan, from 2010/2011, was to be at 10,700 MW of non-hydro renewables, with Pickering NGS closed. Obviously the nuclear industry deserves most of the credit for extending the life of their reactors, but some of us pitched in - and I was one who noted the plan was to needlessly increase emissions by displacing nuclear with gas generators alleviated only somewhat by more gas-displacement generators. Then take the derivative with respect to a small change in emissions at t = 0, E0, to measure the extra cost associated with a one tonne increase in emissions at time 0 (that is, the increment in PVD): When applied to CO2 this equation gives the marginal damage from the change in climate that results from an extra tonne of carbon. It is also called the social cost of carbon (SCC)." 3. I believe the US, where the chart is from, uses 2.75%, so the 3% discount rate is close to what is actually used. 4. I pulled data for a full rebuttal, but I chose to make it in the format of a twitter essay. Our analysis also adds another wrinkle to the price uncertainty versus quantity uncertainty debate that has colored discussions of tax versus cap-and-trade systems. In particular, this research suggests that environmental taxes that directly affect consumer prices result in a larger demand response than an equivalent supply shock.